After having to contend with 32-bit (x86) Windows 7 Beta 1, the Windows 7 64-bit (x64) Beta 1 is finally leaked to Internet, and available to download via torrent with any BitTorrent (BT) clients. The leaked 64-bit Windows 7 DVD ISO image is untouched, unmodified original image from Microsoft, which has the initial package file name of MICROSOFT.WINDOWS.7.BETA.7000.0.081212-1400.ULTIMATE.X64.ENGLISH.DVD-WZTiSO, appear to be leaked from a Russian site. The torrent will download 7000.0.081212-1400_client_en-us_Ultimate-GB1CULXFRE_EN_DVD.ISO. Update: Official direct download links for Windows 7 Beta (32-bit and 64-bit) is available. Important Fix: KB961367 to fix MP3 corruption issue. Microsoft is widely believed scheduled to officially launch public beta of Windows 7 on January 9, 2009 soon, which can be as soon as today. So for those who wants something more official and reliable, which has the exact same hash code for the ISO, just wait for official release. 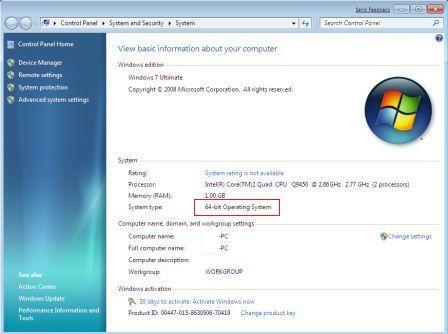 Windows 7 is expected to be officially RTM and released before the Christmas 2009 holidays to Microsoft partners, with retail box versions out in the market early 2010. The assembly branch to create the release candidate (RC) of Windows 7 is likely going to be from the build 70XX series.